So, this story began in late 2013 in the Emergency Room. They kept him for two days… a very long two days… and released him with a treatable diagnosis. In our usual style, my dad, my husband and I celebrated by hitting the Hollywood Park Horse Race Track. 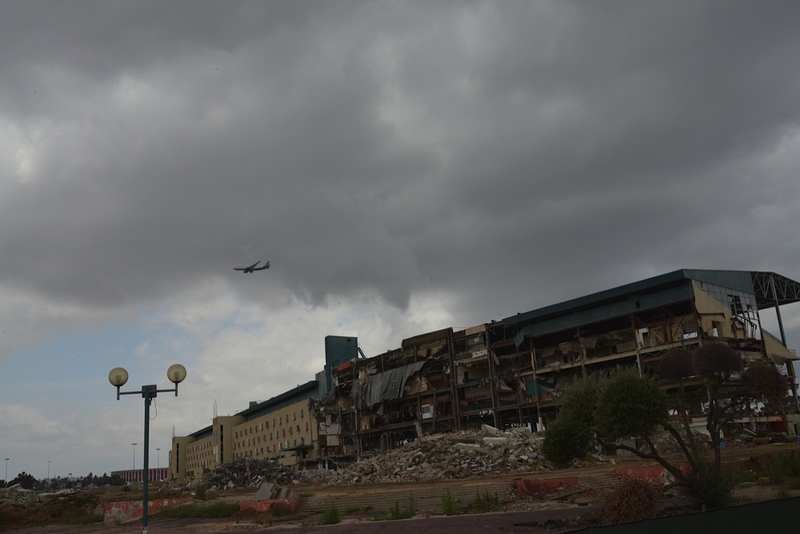 Before its closure, we often went to Hollywood Park for Fathers’ Day and other special occasions. Growing up, my dad always had the horse racing channel on TV, because he really enjoyed the sport. To be completely honest, the horse race track wasn’t ever my thing. I always went for my dad with a fake smile on my face. I found it boring sitting there, waiting 30 minutes in-between races, and betting on the ponies. But now, after the scare, I welcomed the celebration, and we ended up having a wonderful time. Unfortunately, a few weeks later, when we received the results from the biopsy, we learned that my dad had Stomach Cancer. Hearing the words “cancer” was devastating, and then hearing the word “stomach” next to it was double devastating. Stomach cancer is the 2nd deadliest cancer in the world. It’s often caught in the United States in the advanced stages where survival is less than 14%. There is very little research, and the prognosis overall is not good. As an only child, with no other family except my mom and husband in the United States, this reality was a huge blow. I wasn’t ready to loss my dad… my hero. In the middle of doctor appointments, Santa Anita Horse Race Track became our second home. Santa Anita has always belonged to my husband and my dad… it was rare for me to get included… very rare. 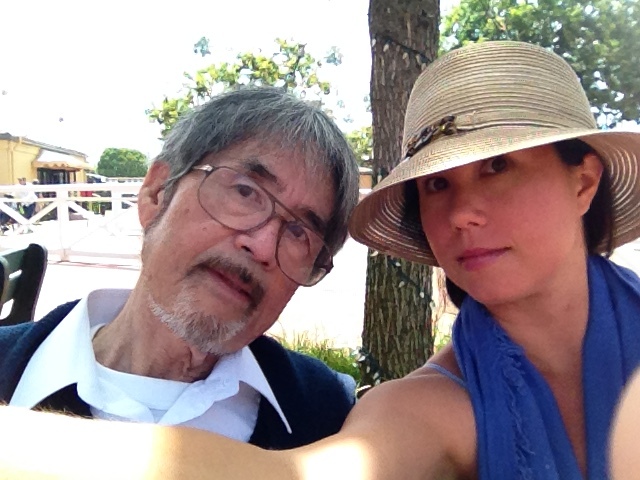 My husband and my dad bonded at the Santa Anita Horse Race Track… There he had asked my dad for my hand in marriage. The boys would go to the far race track… the pretty one… once or twice a year. On opening day we planned a grand entrance… Limo, fancy hats, champagne, Turf Terrance, and friends. It was fun. It was actually, really, really fun. Not only was I enjoying spending this time with my dad, but I was likewise getting into it. We probably visited the race track 10 times before the surgery… the surgery to remove his whole stomach and lymph nodes. The day before the 8-hour operation we were at the track of course. 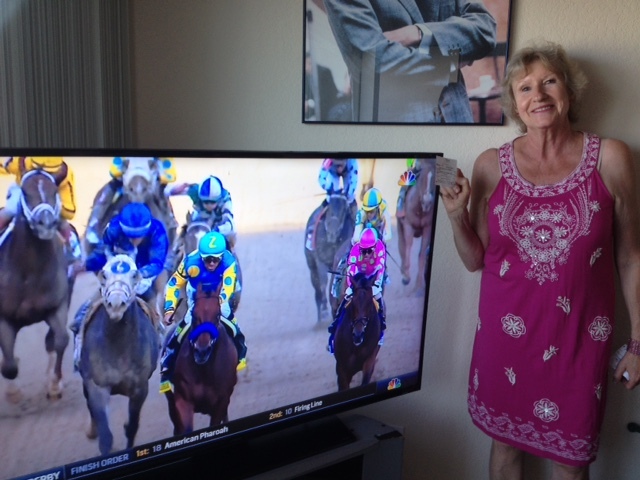 By now, I was able to point out the jockeys… you,–Victor Espinoza, Corey Nakatani, Mike Smith, and Gary Stevens. I was able to point out the trainers and some of the bigger owners. We had done a few Santa Anita tours, and we were on a first name basis with different track employees. Wow, I was realizing, there was more to horse racing than pink polka dot jerseys, and the guy that played the horn 10 minutes before each race. 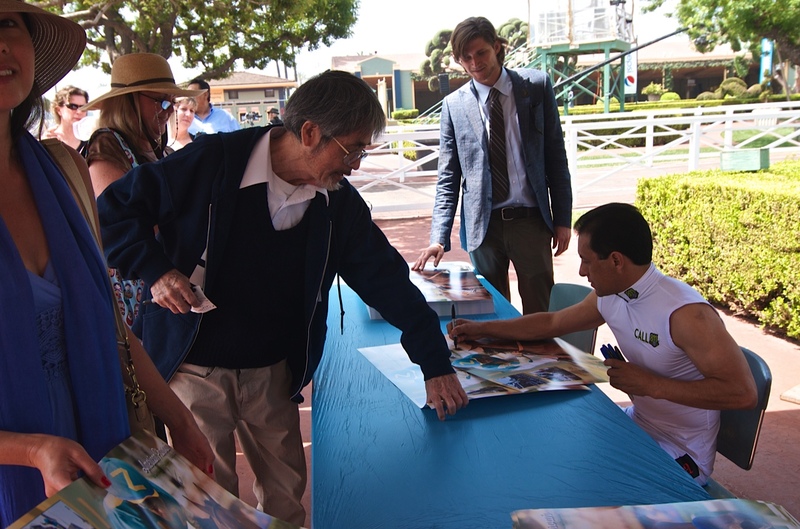 We promised my dad if he recovered quickly, we would throw him a huge birthday party at Santa Anita for the Tokyo Cup. After having a total gastrectomy on February 11, 2014, and spending 10-days in the hospital, my dad miraculously pulled through, and we did it again…. Limo, fancy hats, champagne, Turf Terrance, and lots of friends…mine and his. It was such an amazing day… but it was short lived. Shortly after, he begun chemotherapy, and our real nightmare began. Chemotherapy was very hard on his body. The side effects were awful, and then his blood counts began to be critically low. He wasn’t allowed to leave the house, and he couldn’t have any visitors. Every two weeks, he would have a 6 hour chemo infusion and then a take home bag that would pump 5-fu for the next 46 hours. His spirits were low especially after each cycle made him feel worse. Ah… and then there was the 2014 Kentucky Derby and California Chrome. A couple weeks before The Derby, my husband promised my dad that we would stop and buy tickets and watch the race together at his home. The week leading up to The Derby was terrible and he had major chemo brain. He called my husband day of and gave him his picks. He was adamant that the big winner would be number 6. Now to get actual tickets… physical tickets… we had to drive to Hollywood Park, buy them, and get to my parents’ house before the home nurse showed up. She would come by every two weeks to unhook his chemo pump, check his vitals, answer any questions or concerns, and flush out his port. It was a lot to deal with that and get into position to watch the race. I know… we could have called the picks in or betted online… but there is something nostalgic about having the actual tickets in hand. It’s not like being at the race… It is like having a piece of the race at home. So, anyway, if you recall last year, California Chrome was actually number #5. When we got to my parents’ house and my dad saw his tickets all centered about #6, he was broken hearted. Poor husband… got in his car, drove all the way back to Hollywood Park and fixed the problem. My dad meant #5 not #6. He was for you, Victor, and California Chrome. All of the trouble was worth it when California came in first! California Chrome didn’t win the Belmont Stakes. He didn’t even come second or third. He came fourth. It was a weird time for us. We were so hoping we’d see a Triple Crown, and we were disappointed when it didn’t happen. We thought this might have been our last time as a family to see such a historical event. “At least he tried” was all we could come up with. After that race, it was a dark time in my dad’s cancer journey. It was like my dad had nothing to look forward to. No Triple Crown winner… my dad was 97 lbs. by this point… he was quickly deteriorating … and the races had moved to Del Mar for the rest of the season. And then one day… months and months after all of my dad’s aggressive treatment ended… my dad felt better. (He was spending his time studying the horses). It was now the 2015 season and my dad was ready to go back to Santa Anita. And so we did it; all of us. My dad has his good days and his bad days… but on race day, they are always good! 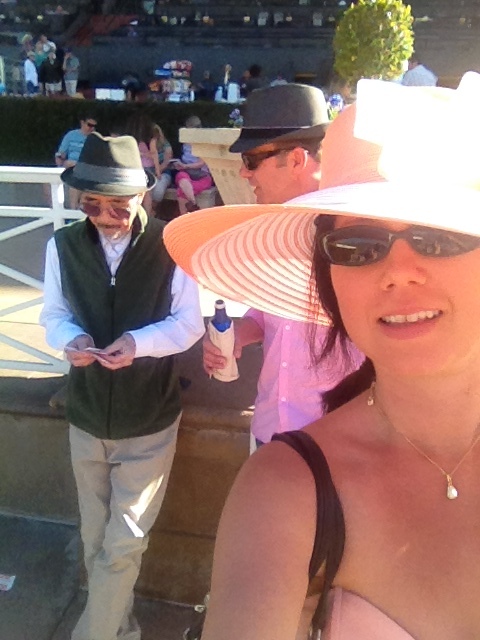 We got back to the swing of things… made Santa Anita a regular thing. And soon enough, we heard a rumor that American Pharaoh was the one to watch. 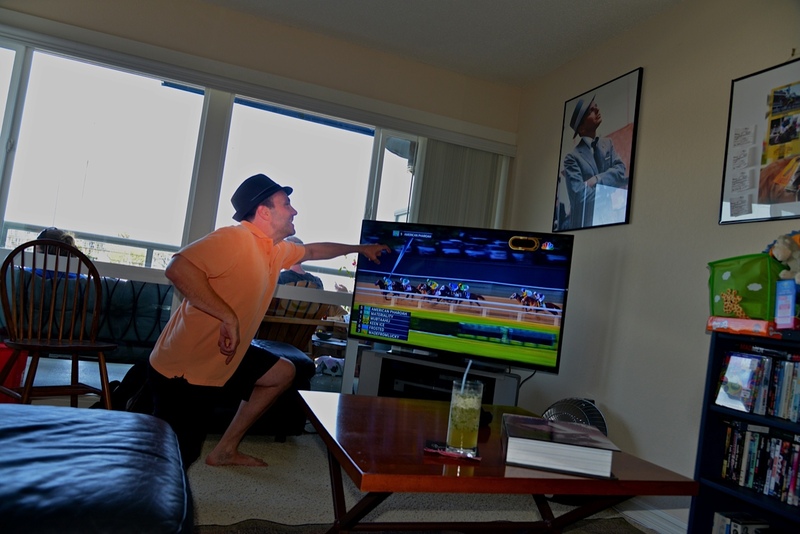 This year we were able to have actual viewing parties at our apartment… The Kentucky Derby, The Preakness Stakes and my all-time favorite… the Belmont Stakes; with the guest of honor, being my dad. This year, my dad drove to Hollywood Park and bought his own tickets. In between the Stakes races, we had the opportunity to meet you and get some autographs. Don’t worry, you were unbelievably nice. This year, we saw something that hadn’t happened in my lifetime…something that hasn’t happened in 37 years… we watched American Pharaoh take the Triple Crown. And my dad was smiling from ear to ear.